Knives are tools. They can be used to cut open packaging, sharpen a firestick or cut steak at dinner. Helle is a Norwegian knife company that creates amazing knives, and I am fortunate enough to be reviewing their Bleja knife. It is one of two folding knives that they make. Click HERE to read the rest of my initial thoughts on this sweet knife. 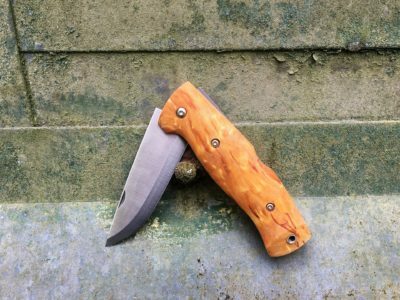 This entry was posted in Reviews and tagged 4alloutdoors.org, backpacking, Bleja Knife, Camping, curly birch wood, folding knife, gearreview, Helle, Helle Bleja Knife, hiking, Initial thoughts on the Helle Bleja Knife, knife, knife review, outdoors, trekking. Bookmark the permalink.